Which of these is your greatest or most frequent fear? Is it on my list? But more importantly, what is the greatest fear of those you manage or work alongside? Do their fears impact how successfully you can do your job and how effective the whole team (or business) is? A friend recently commented on fear being the tool of control and power throughout their childhood and early adulthood. Politicians want us to be fearful so that they can control our voting, our preferences, our behaviours. In the same way schools often maintain control through fear as do parents, local councils, employers, community groups and to some extent even the friendship groups we have ‘don’t argue with our defacto leader or we’ll exclude you’, ‘If you’re late to another dinner, we’ll just stop inviting you’. People and institutions encouraging us to be fearful is a driving force behind many behaviours in the workplace. We bring fear with us to the workplace. But behaviours driven by fear often result in people not achieving their potential, not doing what needs to be done, not tackling the more sensitive issues, not dismissing staff who are disruptive, not challenging the status quo, not striving for growth and change. But it strikes me that if you tackle the issue of fear in your workplace and help even just some of your staff become less fearful, you might just resolve a few of these frustrating issues that test all of us … manager, leader, business owner, or even just colleague. Here are some of the fears again, set alongside some of the repercussions that can arise as a result of letting fear overrule common sense, business needs, personal values, communication or behaviours etc. looking like a muppet LEADS TO you refusing to share your opinions in team meetings so your voice is simply not heard and a number of your colleagues may even believe you have no opinions. being bawled out LEADS TO you keeping your head down, you don’t stand up to support others when decency might expect you to and you don’t reach your potential because you spend so much of your life with your head down. not being liked LEADS TO you becoming too agreeable, you socialise even though you want to go home and do your own thing, you don’t challenge your colleagues, you allow unacceptable behaviours from others to pass unchallenged. something different LEADS TO you missing out on the excitement and adventure of life. While you were considering applying for a job, 5 other people did apply and the new job has already been offered to someone one else while you’re still making your mind up. making a mistake LEADS TO you doing less rather than more, you keep your head down, you blame others rather than face the consequences of your own actions, you are less than honest when things are going right. loss of control LEADS TO you getting stressed, you might even get angry, you are anxious so lose sleep so get even more depressed and stressed, you put in controls that make you feel safe although the consequences are you stifle innovation and creativity as a result. losing your job LEADS TO you not speaking up when you ought to, you don’t seek to challenge, you don’t feel valued, you lose trust in those around you. being found out (i.e. that you’re not up to the job) LEADS TO you choosing attack rather than defend, even though there is nothing to defend, others find you difficult and confrontational, you are defensive with your friends, your work suffers as your anxiety increases. You might even suffer health issues such as IBS or depression. loss of authority LEADS TO you worrying about money, security, family etc. you become overly conscious about your perceived status in the workplace and also outside of it, you revert to ‘tell’ rather than ‘collaborate’ mode, you might even have a heart attack brought on by all the worry. upsetting the status quo LEADS TO you not sleeping well, you don’t push for change where that is good and needed and instead seek to maintain the status quo. being taken advantage of LEADS TO you becoming passive aggressive or you attack, you over control the world around you, you distance yourself from others. isolation LEADS TO you becoming too demanding and losing all sense of balance, you become clingy with your colleagues, you blame your manager for not telling your about an advertised promotion, your anxiety heightens to the extent that you become depressed. responsibility LEADS TO you turning down opportunities to step into management, you turn down tasks that appear to have a degree of responsibility attached to them, people perceive you as less capable than you are, you lose out on the salary potential that can come with responsibility. being asked to do something that will be too challenging LEADS TO you becoming known as the one who always pushes back, who cowers in the back row to avoid being given a project to manage, who plays it safe across their life rather than risk a moment’s discomfort through operating outside your comfort zone. Fear is all pervasive. Fear damages wellbeing. Fear stops people from wanting to achieve their potential. Fear impacts profitability, innovation and staff morale. You only have to look at some ridiculous decisions in recent years to understand how fear for some has become all encompassing and totally disconnected from reality. I recall a media report a few years ago telling of a primary school chopping down all the apple trees in its playground to avoid a pupil being hit on the head by a falling apple in the Autumn. The headteacher who gave the go ahead for this, depriving pupils of seeing apples develop and ripen, playing in a green environment, seeking shelter from the sun in summer etc in my opinion, has lost all sense of reality – fear of what might happen can be all pervasive and so damaging in the long term. So when did you in the workplace last talk about fear and put in place some workshops, seminars or training to help individuals overcome some of their fears? Even those who say they have no fears probably need support. Self awareness and the ability to communicate with others about our fears, our biases, our worries etc are a critical part of ensuring mental wellbeing which, if I am correct, is the huge buzz word (phrase) of the year. Those who say they have no fears are not being honest with either themselves or those around them. We all have fears and to a greater or lesser extent allow those fears to impact our behaviours. 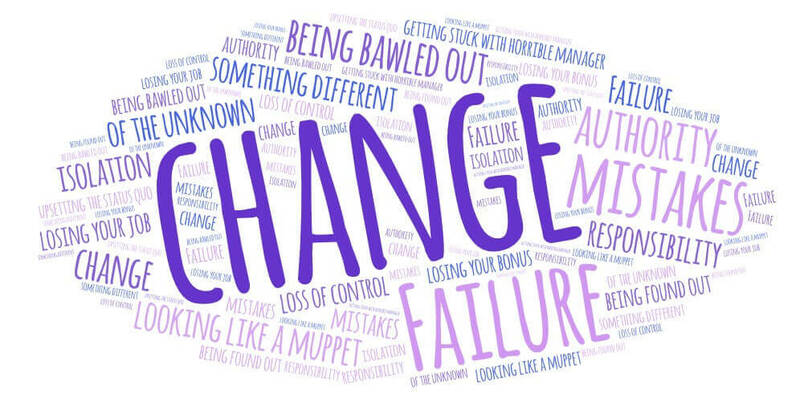 So would you find value in holding workshops to help individuals overcome their fear of change or their fear of operating without a written procedure or policy? Would you deliver training to those who fear criticism or not being liked to help develop resilience and confidence? Would you be bold enough to say that there comes a point when risk aversion is likely to result in the business losing its competitiveness and is therefore no longer tolerable? It’s certainly no easy thing tackling FEAR. But that doesn’t mean you shouldn’t try! My observations are that fear in the workplace is mostly driven by employees bringing to the organisation pre-existing low self-confidence, low self-esteem and belief systems around expected behaviours. I have also observed it in spades when dealing with certain organisational cultures that don’t allow for openness, or that don’t require or value respect. Fear can also be a driving force in a business with a leadership team that places power and ego over employee relations and business sustainability. Get the board or your senior team to discuss this, being clear on how it is impacting the business and identifying the benefits of tackling it. If no benefits are understood or the benefits are too little and there is as a result, no senior team buy in, you can’t even begin this process. Review the culture of the organisation and individual teams. Identify if cultural change is needed and if so, what change is needed. Specifically ensure that cultural ‘norms’ that include yelling, public humiliation, punishment, blame or insulting treatment of juniors are totally eradicated. Carry out a TNA (training needs audit) Here is where you can start to narrow down specific needs, moving from the macro to micro. How big is the problem, what are the specific challenges, what interventions might be appropriate, what benefits are being sought? Review what’s working, what needs changing, what needs adding in, what no longer add values, what benefits are being achieved, what’s the plan moving forward. Adapt, adjust and carry on! Addressing root cause issues has been a mantra of mine for over 20 years in running and HR and Training business. So much time and money is wasted dealing with the consequences of behaviours rather than tackling the root cause. Taking some time to think about and address the fears your employees have may just be an incredibly rewarding project! I’d love to help (email me) if you are looking for support with this, otherwise wishing you the very best of luck and please do share your success stories.